In the wake of the tragedy at Sandy Hook, there is little doubt that the gun violence debate in the United States has radically changed, with proponents of gun control and mental health care gaining greater acceptance. Even those calling for an end to violence in the media have found a more receptive audience. Several films scheduled for release since the Newtown shootings, such as revenge auteur Quentin Tarantino’s Django Unchained, have been delayed. And following reports that Newtown killer Adam Lanza may have played violent video games, West Virginia Senator Jay Rockefeller has introduced legislation to study the impact of video game violence on children. Americans have already had this conversation once this year, following the grisly theater shooting at the opening of The Dark Night Rises in Aurora, Colo. But movie studios seem to have recused themselves from the discussion. Rather than produce films with a critical view toward violence, their only effort to acknowledge the controversy has been to simply postpone the ones that glorify violence to a more socially acceptable hour. It was at another opening night, however, that I began to think seriously about this issue: The Hobbit: An Unexpected Journey, the first installment in director Peter Jackson’s three-part adaptation of the novel by J.R.R. Tolkien. Perhaps it’s not the kind of film you’d expect to prompt a critical examination of violence in the media. But this film was released the same day as the Newtown massacre. Also, as a lifelong Tolkien fanatic — my father first read The Hobbit to me when I was too young to remember — I was struck by the heightened level of violence in the film as opposed to the book. Granted, the violence portrayed in The Hobbit is of the swords-and-sorcery variety, with comparatively little blood and gore. Nevertheless, Jackson did add several action-packed battle sequences that were not present in the book and expanded those that were in the original into set-pieces of central cinematic importance. This is especially evident in the film’s final scene — spoiler alert — where the titular hobbit, Bilbo Baggins, attacks a goblin warrior to defend the dwarf-prince Thorin Oakenshield. In the narrative arc of the film, this is Bilbo’s big moment. He spends most of the film more concerned with pocket handkerchiefs than heroism, hindering more than helping the 13 dwarves and the wizard Gandalf with whom he embarks on his unexpected journey. With this display of violence, however, he wins the trust of his companions and establishes himself as a hero. This sequence is entirely missing from the book. There, Bilbo’s big moment is his underground confrontation with the creature Gollum. 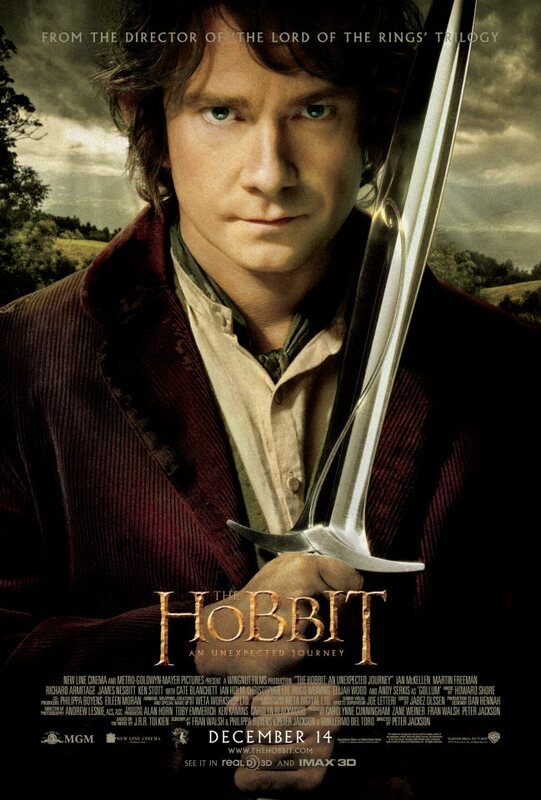 After beating him in a game of riddles, Bilbo demands that Gollum lead him out of the caverns in which he is lost. Gollum, however, reneges on the deal and tries to murder Bilbo. The hobbit is only saved by his chance discovery of the One Ring of Lord of the Rings fame, which grants its wearer the power of invisibility and which allows him to hide from Gollum. It also gives him the chance to kill the tortured creature without being seen. This pivotal scene makes it into Jackson’s film too, where it is powerfully realized. But it is robbed of its impact by the closing fight scene, effectively shifting the locus of heroism from the practice of mercy to the practice of violence. As we challenge the “violence belief system” in the wake of Newtown, as Waging Nonviolence columnist Ken Butigan recently wrote about, we cannot neglect this prevalence of violence in the entertainment industry. We cannot ignore the fact that violence asserts its cultural dominance not only through ultraviolent movies like Django, but also through seemingly innocuous fantasy flicks like The Hobbit. At the same time, however, predictable calls to “turn off the TV” and boycott violent movies are not enough. We live in a violent world, one where the use of physical force finds wide social acceptance as a means of “solving” our problems, one where we bitterly mourn the deaths of 20 elementary school students even as we silently sanction the use of drone attacks that have killed dozens, perhaps hundreds of children. We cannot run from the reality of violence, in our media or elsewhere. Not only is it unrealistic, but quite honestly, I would not want to deprive myself or my future children of a beautiful story like The Hobbit, even with its violent elements. We owe it to ourselves and to our children to engage creatively and critically with that violence. Longtime children’s television host Fred Rogers once said, “When I was a boy and I would see scary things in the news, my mother would say to me, ‘Look for the helpers. You will always find people who are helping.’” As we look beyond the carnage for the helpers after Newtown, we can also look beyond movie violence to those quieter, less visually dramatic moments where we find nonviolent lessons of incredible power. The Hobbit offers us a way to do just that, though we have to dig beneath the traditional fantasy movie tropes to discover it. Thank you for this discussion. As I read it, I kept thinking of A.O. Scott’s provocative recent discussion of Django Unchained and Lincoln — two very different kinds of films about slavery. While Scott has nothing but the heighest praise for Lincoln — which depicts the abolition of slavery as a genteel legislative operation among white men — he is far more cautious about the “brazenly irresponsible” Django Unchained and its fantasies of violent revenge against slaveholders. (The Washington Times calls it, outright, a product of “anti-white bigotry.”) Scene for scene, Django is by far the more violent, and celebrates violence as liberatory. But what is to be said about the offscreen violence of the brutal Civil War, and of the absence of black agency in Lincoln? Albeit implicitly, aren’t mass murder and white supremacy, of a kind, allowed to triumph there? Not only do we have to be on the lookout for violence being depicted where it need not and should not be, we need to look for where it is being obscured and hidden from view for the sake of perpetuating our mythologies of great men and great wars and our blindness to the far greater power and suffering of ordinary people. Lincoln portrayed the effects of violence. Heartbroken people. Fields of dead bodies. Piles of sawn off limbs. Families torn apart. Desperate sadness. Django portrays violence as a fun tool of revenge. Something to be celebrated and emulated. The moral of the story seems to be get a gun and get back at people who have done you wrong. Both are about violence, but they are not the same. One is pro-violence and one is anti-violence. …the lord of the rings vid’s were terrible…. go along a bit…. horrifically bloody battle… plenty blood…hacking …hidious monsters etc…… go on a bit further ….and oh another horrifically bloody..etc and that was it….. the most tragic thing about is…that if my teens ever read of the rings ( doubtful ,unfortunately )…all they’ll see in their minds is the film….. I don’t have much tolerance for violence in movies, especially violence that I consider gratuitous, and often close my eyes to the 20 minutes of mostly violent trailers when I do go to a movie. Nonetheless, I admit to the prevalence of violence not only in our culture but in nature itself–witness its ageless brutal battles for survival of the fittest. I did appreciate Fed Roger’s mother’s comment about looking for the helpers and Tom Emanuel’s observation about redeeming moments in The Hobbit. Today I saw the new British film version of Les Miserables. In the midst of Jean Valjean’s own personal struggles and violent revolution in the streets of Paris, there is the scene of Jean Valjean sparing the life of his indefatigable tormentor Javert. That one non-violent act overshadows almost overwhelming evil and is an amazing reminder of the power of redemption in the human soul. In this case as in so many others, non-violence is rooted in inner transformation at the level of the individual. Actually, the result of JFK’s Commission on the Children headed by the reknowned Uri Bronfonbrenner was the statement that watching violence led to commiting violence. But, as we can see, that truth was subverted. We MUST do something to rid tv and “games” of all this violence! only centered around exciting the audience but the result is a numbing of society. i am happy that WNV exists.